Lately, there has been a lot of nostalgia for the bygone days of being able to head to your local Blockbuster Video and browse around an actual store filled with movies, as opposed to just browsing around Netflix for an hour only to wind up rewatching The Office. Again. The folks promoting the home video release of Deadpool 2 decided to capitalize on this nostalgia in a pretty amazing they. 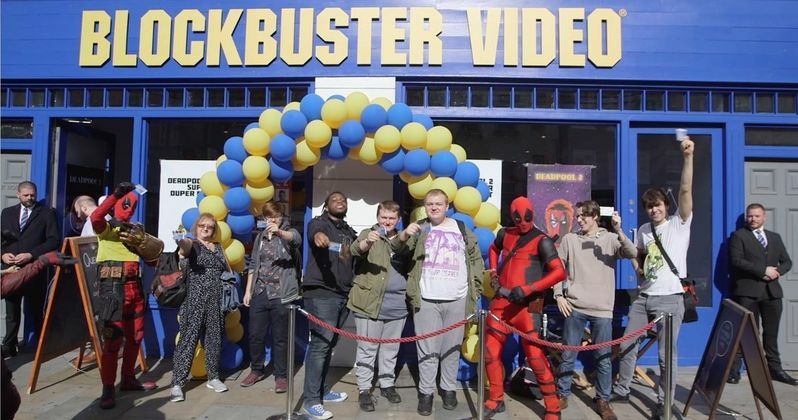 They opened up a pop-up Blockbuster in London that perfectly recreates the store we all knew and (most of us) loved so much. There is one catch, though. This Blockbuster Video only carries copies of Deadpool 2. Beyond that, everything is as it should be. The store is only open for two days, September 17 and 18, and they are giving away 1,989 copies of Deadpool 2, in order to commemorate the year that the first Blockbuster opened in London. There are some pretty amazing promotions to go along with the whole deal too, as opposed to just handing out standard Blu-ray copies of the movie. Anyone who drops by that actually still has a copy of their old Blockbuster rental card will be given a very authentic looking VHS case for Deadpool 2. They will also be given a digital download code so they can actually watch the movie. But the VHS case will make an amazing decorative conversation piece. Those who don't have a card can do their best to impress cashiers with "superpowers" in order to obtain a Superhero Edition membership card and a copy of the movie. If only these stores were popping up all over the world right now. This comes as the world mourns the true death of Blockbuster. The company filed for bankruptcy in 2011 after Netflix started becoming increasingly popular and destroyed their business model. However, a handful of stores were clinging on around the country, with two stores in Alaska gaining a lot of notoriety online. John Oliver even sent a bunch of Russell Crowe movie memorabilia, including a jockstrap from Cinderella Man, to the Anchorage location. Unfortunately, it was announced recently that the Alaska stores are also closing for good. That just leaves one last remaining Blockbuster in Oregon. Quite frankly, it's amazing that these last few stores made it this long, but it's still sad to know that the chain is inches away from being good and truly dead. Luckily, the marketing team for Deadpool 2 came up with this pretty brilliant idea and gave a few thousand lucky people in London a very nice little blast from the past. The marketing for both Deadpool movies has been amazing, but this ranks pretty high up there. Maybe when/if X-Force comes out Fox can bring back Hollywood Video? You can check out social media posts from the pop-up Blockbuster for yourself below. Holy Sh** balls! Blockbuster is back open for business baby! Bring me your old Blockbuster card and lets party like it’s 1989.